Even if you get the flu shot, a cold winter spent hiding indoors with the means at some point you’re going to get sick. But just how sick are you? For just $20, iHealth’s new no-touch digital thermometer can help you figure that out, without requiring you to probe anywhere unpleasant. An infrared thermometer that can be used without waking someone up. Doesn't provide an assessment of a measurement. Digital thermometers are far from a new idea; at this point, it’s harder to find the old glass tube variety in stores, but why would you? Digital thermometers are faster, easier, safer, and cleaner—assuming you stick to the armpit or under the tongue to make a reading. Having to stick a probe under an arm, or under a tongue, is fine for adults who’ve learned to tolerate the pokes and prods of doctors and nurses. But kids aren’t so forgiving, or compliant, and even gently sticking the business end of a digital thermometer in their ear can trigger a meltdown when they’re under the weather. iHealth’s new infrared thermometer could be a parent’s best weapon against a cranky, sick child as it allows for lightning-quick temperature readings without actually having to make contact with the skin. Translation: you can easily do it while they sleep. About the size of a candy bar, there are no invasive probes on the iHealth that need to be sterilized. The iHealth is powered by two AA batteries, so you never need to charge it. About the size of a candy bar, the iHealth looks more like a scifi prop than a medical device, with an all-white finish, a glossy top, and a single button on the face for taking measurements. It’s easy to clean, which is a big part of the device’s appeal, given it never actually has to make physical contact with someone who’s sick. 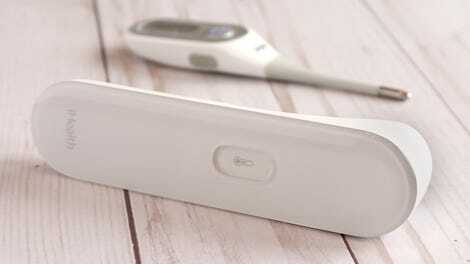 The iHealth thermometer’s sensor takes over 100 readings in a second’s time for improved accuracy. On the underside of the thermometer is a small protrusion that you can either place directly against someone’s forehead, or up to about an inch above their skin, to take a temperature reading. An infrared sensor hidden inside takes over 100 measurements in about a second when you push the button, and the averaged results are displayed in either Celsius or Fahrenheit. Withings Thermo (top) compared to the comparably-sized iHealth digital thermometer (bottom). In terms of design and usability, the iHealth thermometer looks and functions like Withings’ Thermo, but in practice, it is much easier to use. The Thermo requires its business end to be placed near the middle of a child’s forehead, and then slowly slid over to the temporal artery on the side of the head to get the most accurate reading. It’s slow, and can sometimes take two or three passes to get a proper measurement—and that’s assuming the patient is cooperating. The iHealth, in comparison, is a fast, one-click, point-and-shoot tool that provides a reading basically immediately. You can even take multiple measurements to double-check your results in the same amount of time it takes to do just one with the Withings Thermo. The display on the Withings Thermo (left) isn’t as bright or crisp as the iHealth thermometer’s (right). I even prefer the brighter, crisper display on the iHealth thermometer over the Thermo’s, which is always easy to read. And having tested both digital thermometers numerous times on the same forehead (mine), I’ve found they rarely differ by more than half-a-degree. The iHealth’s no-touch measuring approach doesn’t affect its accuracy, so why does the Thermo cost $100, while the iHealth is just $20? With every click of the button, the iHealth only delivers a temperature reading on its display—nothing else. The Withings Thermo, on the other hand, wirelessly connects to an app where you can assign measurements to the various members of your family, and it will automatically store all of their temperature histories. 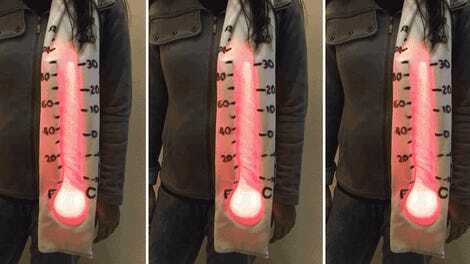 That’s handy when monitoring the progress of a fever, but it’s not necessarily a must-have feature. What is, however, is the Withings Thermo’s ability to let you know what a temperature measurement actually means using a green, yellow, or red color system—with red being a strong indicator that it might be time to visit a doctor. Temperature ranges vary by age, which is why setting up individual users through the Withings app allows the thermometer to determine if a measurement indicates a serious problem or not. Even basic digital oral thermometers designed for young kids provide this feature without an app but are limited in use to a very specific age range. Sometimes the no-frills approach isn’t necessarily the best approach. 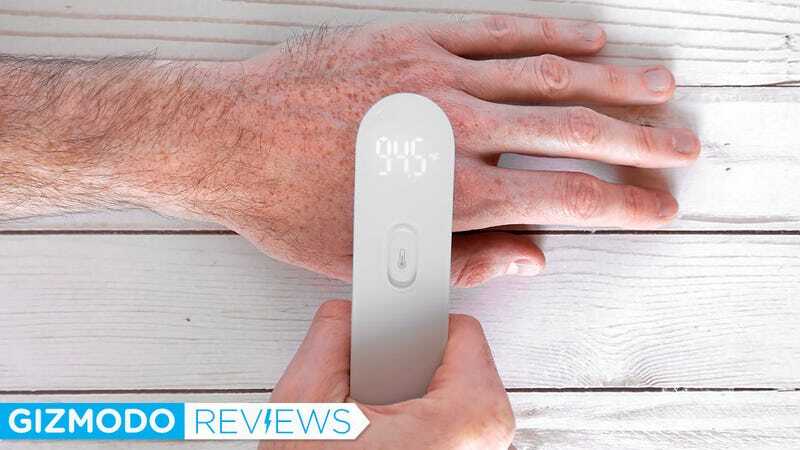 The iHealth thermometer takes a no-frills approach to features to hit that $20 price point, but in this case, that’s not necessarily a good thing. The no-touch functionality is a great feature when you have to deal with cranky kids, but when you’re taking a reading in the middle of the night, the average parent is probably not going to know the exact temperature that indicates a fever or serious health problem. Even a simple warning that a temperature reading might be too high would be a welcome addition, and that’s a feature that’s found on other digital thermometers for as little as $10 more. A sleek design that’s easy to keep clean, especially given the thermometer never needs to touch a patient. At $20 it’s one of the cheapest forehead digital thermometers you can buy. Only requires a quick second to take a measurement. Can be easily switched between Celsius and Fahrenheit modes. Does not indicate if a temperature measurement is indicative of a fever or something more serious. Why Haven&apos;t Mugs Told Us the Coffee&apos;s Temperature Until Now?